The daytime population in cities, counties and other areas changes due to commuting. The daytime population in Manhattan, New York County, increases by 95% during the day; the daytime population of Redmond, WA (Microsoft) increases by 111%; details below. Daytime population change impacts on decision-making relating to business opportunities, security, transportation management and wide-ranging issues. This section is focused on using daytime-related population to facilitate decision-making. The concept of daytime population refers to the number of people who are present in an area during normal business hours, including workers. This is in contrast to the resident population present during the evening and nighttime hours. Information on the expansion or contraction experienced by different communities/areas between nighttime and daytime populations is important for many planning purposes, including those dealing with market size, trade/service areas, transportation, disaster, and relief operations. The following tables/graphics show the ten counties and ten cities with 50,000 population or more that experience the largest percent change due to commuting. See 9th column %DayPop. Use this interactive table to examine characteristics of counties and cities/places for the U.S. overall, by selected state and/or by population size class. The above graphics were developed using that table. Column headers in the above graphics are defined in that section. These data are based on 2010 ACS 5-year estimates and will update in December 2013. These data are the first commuter-adjusted population estimates based on the American Community Survey (ACS) and the first commuter-adjusted population estimates since Census 2000. In the interactive table section, go through the step-by-step example for Texas substituting your own state of interest. For example, Shawnee has the highest percent population decrease among Kansas cities 50,000 and over while Overland Park has the highest percent population increase. These two Kansas cities are both in Johnson County in Kansas City metro. The Employment-Residence (E-R) Ratio is a measure of the total number of workers working in an area relative to the total number of workers living in the area. The E-R Ratio is a rough indicator of the jobs-workers balance in an area, although it does not take into account whether the resident workers possess the skills needed for the jobs that are available. E-R Ratios greater than 1.00 occur when there are more workers working in the area than living there. These areas can be considered as net importers of labor. View the E-R Ratio for any city or county in the interactive table. The E-R Ratios are shown in the rightmost columns in the above graphics. 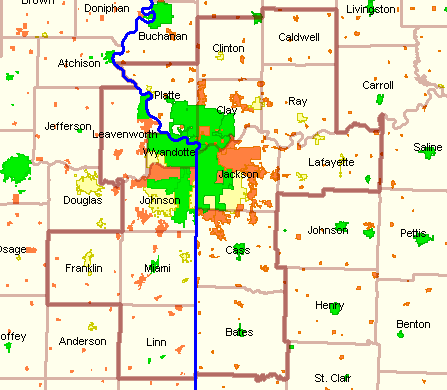 The following graphic shows the Kansas City MSA (brown boundary) with county labels. Cities are shown with E-R colors: orange: <0.8 E-R; yellow: 0.8 to -1.2 E-R; green: 1.2 or more E-R. Cities with an E-R ratio of 1.2 or higher (green fill pattern) means that there are 20 percent more workers working in the city than living in the city. The CV XE GIS software and the daytime demographics dataset can be used to visually examine areas of interest. An upcoming post will cover updated, more recent data. An ACS 2011 update is planned for December 2013; an ACS 2012 update is planned for spring 2014. These estimates are now being prepared annually and will evolve into an annual time-series. The time series will facilitate longitudinal analysis of the daytime population and commuting patterns. 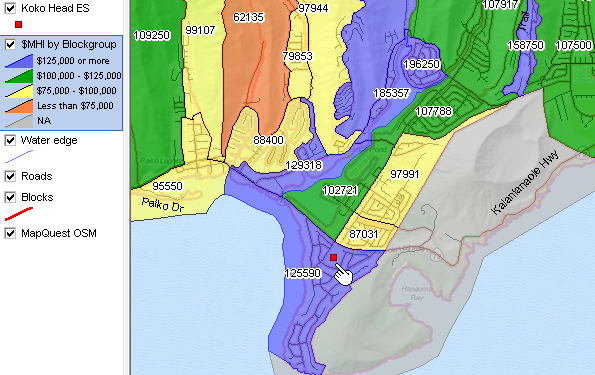 Location-location-location … this section illustrates use of GIS tools to develop custom maps showing location of points of interest, based on addresses, in context of other geography and patterns. Anyone with Internet access and a Windows-based computer can develop location analyses shown in this section for locations of interest anywhere in the U.S. Starting at the end of this post, the objective is to display/examine the address in the context of related geography as shown in the graphic below. The location, address, is shown by the red marker in context with street (and mini-profile of the street segment) and associated census block (red boundary, yellow census block code). The Koko Head Elementary School address (189 Lunalilo Home Road, Honolulu, HI 96825) is used in this example. It could be any school in the U.S. or any address, school or otherwise. The view and details are reviewed in more detail below. While there are many Web-based resources to obtain a map view of the location based on the address, and/or attributes of the school based on name, resources reviewed here provide a more flexible and comprehensive way to examine a location/school in context of the neighborhood and surrounding area demographics. This process requires the types of resources reviewed here. The study area is in the vicinity of Hanauma Bay located west of Waikiki Beach in Honolulu, HI. The steps illustrated here can be similarly applied to anywhere in the U.S. The next graphic shows a zoom-in view of the study area. The coastline edge is shown with a line-shapefile that depicts perennial water features. 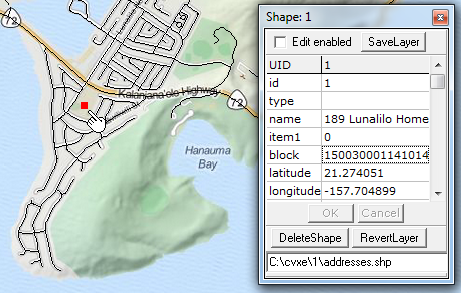 Clicking OK, a point shapefile is automatically created and added to the active GIS project. The next graphic shows the address location as a red marker. The Identify tool is used to show the results of the geocoding. Clicking on the marker displays the mini-profile. The census block code is 150030001141014 or 15-003-000114-1014. The address is located in FIPS state code 15, FIPS county code 003, Census 2010 census tract code 000114, and Census 2010 census block code 1014. 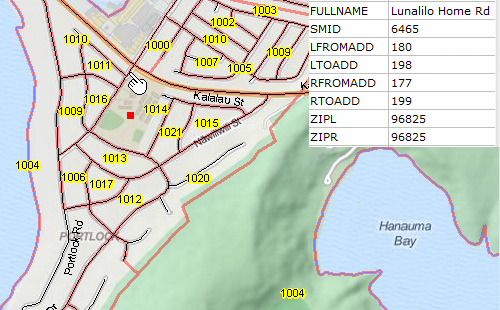 For other potential geo-referencing purposes, and as shown in the mini-profile, the latitude-longitude values are also retained in the shapefile dbf record. A zoom-in view shows the study area in more detail. Roads are shown as black lines; census blocks are shown with red boundaries. 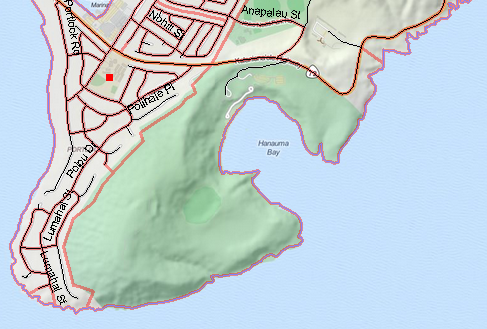 The view shown below shows the location (red marker) in context of street location and in context of associated census blocks. Census blocks are shown with red boundaries and show yellow census block codes as labels. The school is located within census block 1014. Selected attributes of the street segment are shown in the profile. The left- and right-side from address and to address ranges are shown as well as the left-side and right-side ZIP code. These left- and right-side attributes are available for any intersection-to-intersection street segment in the U.S. The next graphic shows patterns of economic prosperity in the broader area. 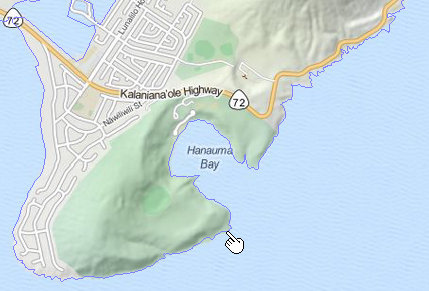 Koko Head ES is shown by the red marker (see pointer). 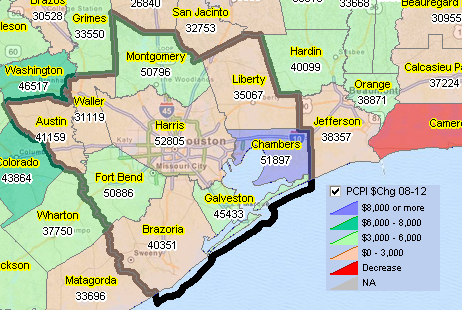 The color-coded areas show patterns of median household income (MHI) based on block group geography. Intervals and color codes are shown in legend at left of map. Labels show the MHI by block group. The gray area has population of 39; MHI estimate is not available. The MHI estimates are based on 2011 ACS 5-year data. 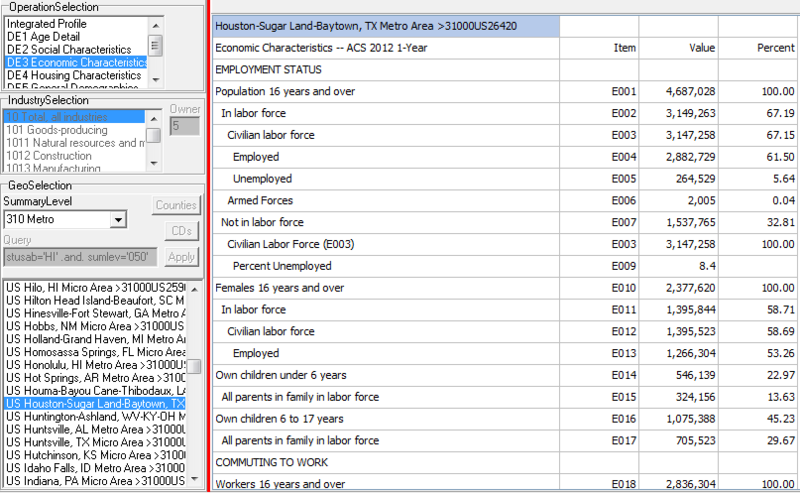 A more comprehensive analysis could select from approximately 250 subject matter items by block group (view available items). A GIS project was developed using the CV XE GIS software (no cost, details below. The GIS project is comprised of two public domain shapefiles: the TIGER/Line 2013 edges/roads and the TIGER/Line 2013 census blocks. The address point location was determined by entering the address into the CV XE Tools>Find Address feature. The Find Address feature determines the latitude-longitude and census block code for the location. A point shapefile is dynamically created. The project is then saved for subsequent re-opening and use. The GIS project and tools used to develop views shown in this section are available to ProximityOne User Group members. Join now, no fee. Members may download the GIS project and dynamically create related view. This application can serve as an example to develop similar applications for locations of interest. • Schools and School Districts Main Page. An upcoming post will delve deeper into using these smaller area geodemographics to develop and analyze neighborhood patterns and trends. Join us in the upcoming December 17, 2013 one hour web session where we talk about using the ACS 2012 5-year demographics for small area analysis. Those new data are scheduled to be released that day. Examining housing value appreciation … the Housing Price Index (HPI) provides a measure to examine/analyze housing price levels and variations among metros and states. The HPI, calculated using home sales price information from Fannie Mae- and Freddie Mac-acquired mortgages, continued upward momentum in U.S. Housing prices remained strong in the third quarter 2013, as prices rose 2.0 percent from the previous quarter. This is the ninth consecutive quarterly price increase in the purchase-only, seasonally adjusted index. It marks the first time since 2009 that the national house price level is higher than it was five years ago. This section reviews use of HPI data and analytical tools to examine housing price patterns and trends among metros and states. The HPI alone provides only partial insights — based on this one measure. Evaluation of housing markets, and the regional economy, trends and patterns need to use the HPI in combination with many other measures. Situation & Outlook reports integrate HPI data with other demographic-economic measures. Use this interactive table to examine the HPI quarter to quarter over the past year by state and metro. The ranking table provides an easy way to rank/compare housing prices for a single metro area or a group of metros. The graphic presented below shows the top-ranked metros based on HPI percent change from 2012Q3 to 2013Q3. Optionally rank on any of the quarter-to-quarter changes. Note that seven of the top ten metros (rate of appreciation over past year) are in California. Using the interactive table, scroll down using the right scroll bar to view how other metros rank. Or, double-click the rightmost column to rank in descending order to view metros experiencing the highest rates of decline. The above graphic illustrates selecting all metros. Using tools below the interactive table, alternatively select all metros in only one state, all states and no metros or other combinations. ProximityOne User Group members (join now, no fee) may download the all U.S. metro shapefile with all items shown in the interactive table integrated into the shapefile, ready to use. Create thematic maps using HPI items with pattern settings of interest. The map view presented above was developed using this shapefile with integrated HPI data. The HPI is one indicator of measuring home value appreciation at the metro or state level. See the FHFA home value calculator that illustrates how the HPI can be used to compute estimated value now or at a different point in time. This tool illustrates the concept but is fraught with problems of real usability. Using differently sourced data, ProximityOne computes housing value appreciation indexes at the ZIP Code area, census tract and higher level geography. This post will be updated in late February 2014, with release of the 2013 fourth quarter HPI. How have neighborhoods of interest changed between 2000 and 2010? Since 2010? How will a neighborhood change going forward? How does a neighborhood’s current and trending characteristics compare to adjacent of peer neighborhoods? This section is focused on resources and methods to examine neighborhood geographic, demographic and economic characteristics and change. View related Web section, providing more detail. The exact geographic definition of a neighborhood is elusive; neighborhood geography is not defined by a national standard. Many areas have multiple neighborhood renderings. While many counties/cities have well defined neighborhoods, most do not. To examine the demographic-economic characteristics of a neighborhood, the best options are to use a combination of census blocks, block groups and census tracts. The Nob Hill neighborhood in San Francisco has changed in population from 20,142 in 2000 to 18,599 in 2010. The White alone population has grown a little while the Asian alone population has decreased from 11,532 (2000) to 9,705 (2010). These population data are from Census 2000 and Census 2010 and determined by aggregating census block level data. 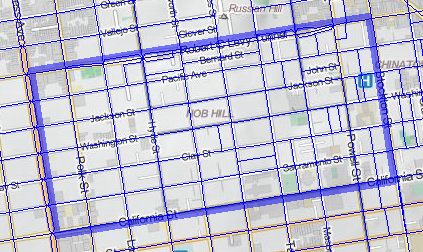 The Nob Hill census block geography did not change from 2000 to 2010 (75 census blocks). Many neighborhoods and census block boundaries and codes change over time complicating longitudinal analysis of neighborhoods. 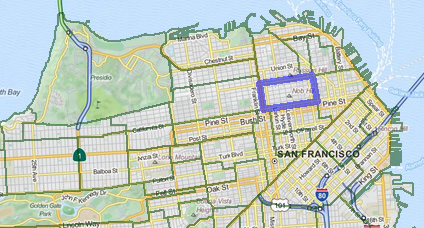 The Nob Hill neighborhood is shown in the following graphic with bold blue boundary; Census 2010 census blocks are shown with lighter blue boundaries. The Nob Hill neighborhood in context of San Francisco. Demographic-economic characteristics of neighborhoods play an important role as decision-making information. The similarity, or dissimilarity, of these small area geographies are the basis for many local government planning operations ranging from law enforcement to transportation. They help businesses determine where to locate — to serve markets where demand for their product or services is greatest. Knowing about neighborhood geography and demographic-economic characteristics are critical to real estate businesses. Census blocks, block groups and census tracts are the most useful geographies from which we can develop neighborhood demographic-economic characteristics. These geographies are all defined by the Census Bureau and nest together. All counties are comprised of a set of contiguous census tracts. Census tracts average 4,000 population and are comprised of block groups that average 1,200 population. Block groups are comprised of a set of blocks that average 100 population. In built-up urban areas, a census block is often the same as a city block bounded by streets. These areas are defined for each decennial census and most boundaries do not change for the decade. These features of known boundaries, covering the U.S. wall-to-wall, non-changing geography, nesting geographic hierarchy — and the availability of extensive demographic-economic data — make them the ideal choices to examine neighborhood characteristics and change. There are advantages and disadvantages for each type of geography. The most appealing feature of census blocks is geographic detail. There are more than 11 million Census 2010 census blocks; approximately 1/3 of these are water blocks and have no population. These are the smallest geographic areas for which the Census Bureau tabulates demographic data. The most limiting feature with using census block demographics is that only decennial census data are available by block; no richer demographics such as income or educational attainment. The most appealing feature of block groups is geographic detail combined with availability of 1) decennial census data, 2) richer demographics from the American Community Survey (ACS) and 3) annual updates from ACS. Like blocks, there are no richer demographics for block groups from the decennial census. There are 217,000 Census 2010 block groups. The most limiting features of block group demographics from ACS include 1) a relative high margin of error associated with ACS estimates, 2) a reduced scope of subject matter data compared to census tracts, and 3) data access and integration is challenging. Census tracts were originally designed by the Census Bureau as a pseudo-neighborhood areas averaging 4,000 population. Approximately 73,000 Census 2010 census tracts cover the U.S. wall to wall. Over time, the demographic-economic composition of many tracts change. Tracts changing the most are often of most interest. The advantages of using census tracts is similar to that for block groups. Compared to block groups, tract estimates are more reliable and there is a broader set of subject matter available. Tract data are easier to access and use that block or block group data. One of the most limiting features of using census tracts to characterize neighborhoods is that tract geography often cuts through more than one neighborhood. This post is a partial summary of this AASA blog … AASA, American Association of School Administrators, was pleased to partner with ProximityOne for our latest economic impact report, Unequal Pain: Federal Public Education Revenues, Federal Education Cuts and the Impact on Public Schools. Using ProximityOne’s custom mapping tools, AASA’s report includes a national map showing the role that federal dollars play in schools district operating budgets. The national map is detailed, shading the various shares for school districts, also outlined at the state and congressional district level. The map is a huge asset to AASA’s report. Absent the map, the report is very data heavy. The map is a clear, concise representation of a very wonky discussion. The map is also a very powerful tool: It shows, at the most local level, how any cut to federal education funding–regardless of how it may be described as ‘across the board’ or ‘uniform’–is anything but. Even the most modest of cuts (less than 2 percent) will be felt very differently in a district where federal dollars are upwards of 60 or 70 percent of their operating budget than in a district where less than 4 percent of the operating budget is federal dollars. The map is a very clear illustration of the unequal pain that stems from federal education cuts. AASA first partnered with ProximityOne a year ago. ProximityOne uses geographic-demographic-economic data and analytical tools to inform discussions and explain current situation/area characteristics. They work with a wide variety of clients, including both private and public sector organizations. This type of analysis may prove valuable to AASA members. As such, we will be partnering with ProximityOne to host a webinar on this map, the ProximityOne mapping tools, and what it can mean for schools.